Giuseppa DiIanni first appears in the Painesville, Ohio, area about 1915. Giuseppa previously lived in Akron, Ohio, with her parents and siblings. In America, Giuseppa DiIanni was known by her married name, Josephine Chriss. Giuseppa DiIanni, daughter of Gennaro DiIanni and Filomena Incoronata Venditto, was born on May 10, 1897, at Frosolone, Italy. 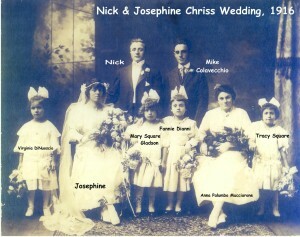 She married Nicola DiCristofaro, son of Cristofaro DiCristofaro and Maria Donata Scacciavillani, on November 18, 1916 at Saint Mary Catholic Church at Painesville, Lake County, Ohio. Giuseppa died on May 9, 1987 at her daughter’s home, 1776 25th Street, at Cuyahoga Falls, Summit County, Ohio, at age 89 of adenocarcinoma of her lungs. Her body was interred at Holy Cross Cemetery at Akron, Summit County, Ohio. Giuseppa DiIanni, age 13, immigrated to the United States on August 2, 1910, travelling to Akron, Summit County, Ohio, joining her brother, Donato Carmine DiIanni. She was travelling with her parents and brother, Felice DiIanni. Felice migrated to Painesville in 1915. 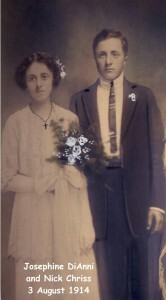 Giuseppa’s sister, Lucia DiIanni, immigrated to Painesville in 1909. 1. Mary Donita Chriss was born on December 5, 1917. She married Allyn C. Hausch in 1942. Mary died in September, 1982 at Florida at age 64 of lymphoma. 2. Philomena Chriss was born on May 13, 1919. She married Anthony Olivo, son of Donato Olivo and Maria Grande, in 1946. 3. Nicholas C. Chriss was born on September 23, 1927. He married Margaret Awtrey. Nicholas died in April, 1990 at age 62 of a heart attack.